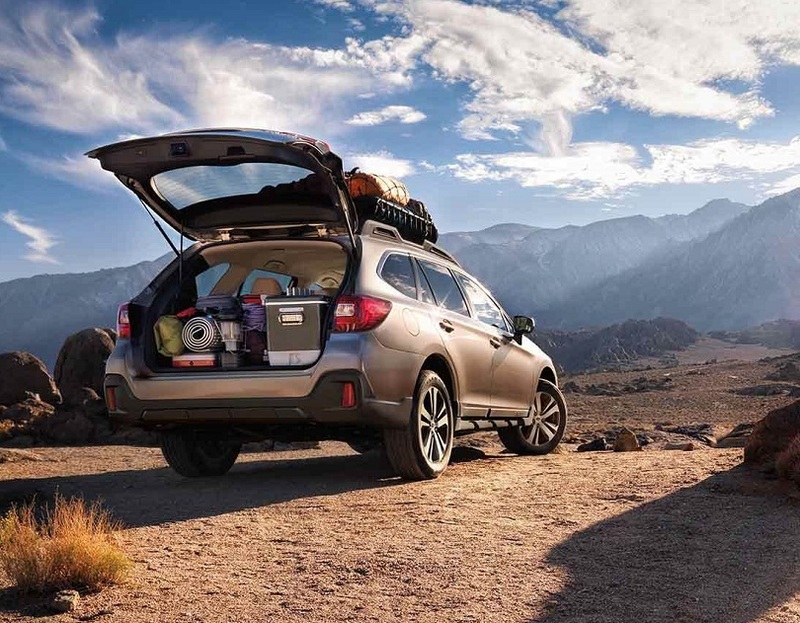 The 2019 Subaru Outback makes a solid first impression with its roomy seats that are spacious and offer plenty of support. Outward visibility is excellent due to the large windows that are present. The wagon offers the most cargo space in its class, which makes it a functional vehicle to use for adventures or traveling. The new model is available at our Flatirons Subaru dealership as we continue serving Denver Longmont Boulder. 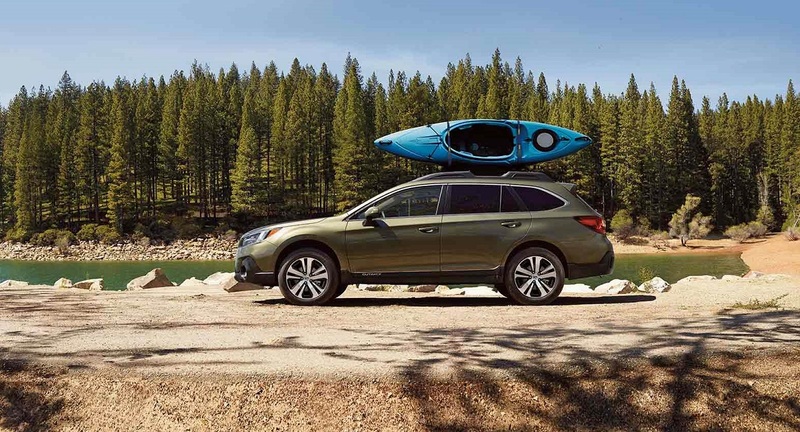 The exterior of the new Outback combines both upscale and athletic styling for an eye-catching car that doesn't look like a traditional wagon. Notable features on the body include a large black grille with a chrome bar, which draws attention to the front of the vehicle without appearing flashy. Fog lights enhance the athleticism on the car, along with roof racks for transporting different types of suitcases or sporting equipment. The high ground clearance of the vehicle also makes it easier to drive on roads with snow or dirt that is present. The 2018 Outback features a similar design to the new model with sharp headlights that extend up the vehicle and fog lights that are added to improve visibility. The angular rear of the wagon looks edgy and includes a spoiler for improved aerodynamics and styling. Large tail lights are the focal point on the back of the car and extend onto the tailgate, which makes them easy to notice at night. Black plastic is used on the bottom of the car's frame and on the bumper, which adds a touch of contrast. The vehicle looks similar to a minivan and continues to have an updated appearance with minor changes that have been made to its exterior. Soft-touch materials are available in every direction in the new Outback's cabin, which proves that it has a solid build quality. Leather upholstery comes standard in higher trims, which causes the cabin to look like a luxury vehicle on the inside. Wood trim accents are added, which look beautiful when paired with light leather. Two rows seat five people with a high level of outward visibility provided. Upgraded options include heated front and rear seats, perforated leather-trimmed upholstery, a leather-wrapped steering wheel, a four-way power-adjustable passenger seat, and 10-way power adjustments for the seats. Standard features include two USB ports, satellite radio, Bluetooth, Apple CarPlay, Android Auto, and the Starlink infotainment interface. 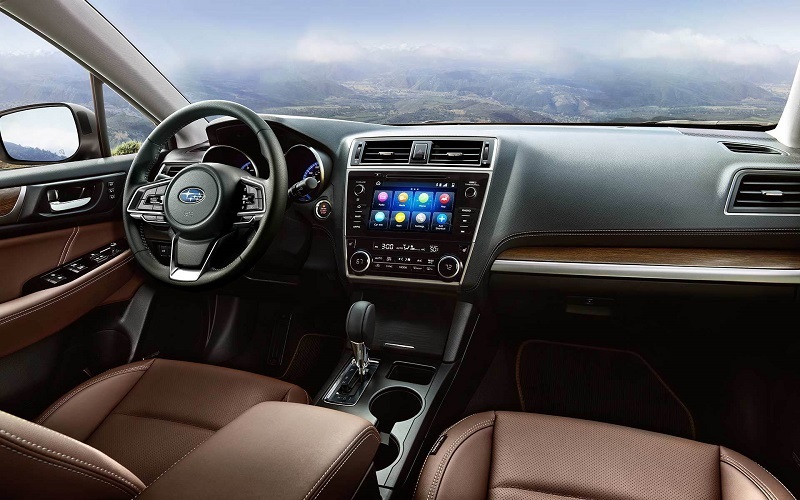 The interior of the 2018 Subaru Outback includes Apple CarPlay, a 6.5-inch touch screen that comes with an infotainment system, Android Auto, a USB port, HD Radio, a four-speaker sound system, satellite radio, and a rearview camera. Optional upgrades that are offered include a Harman Kardon audio system, a moonroof, dual-zone automatic climate control, push-button start, a proximity key, an upgraded 8-inch touch-screen infotainment system, adaptive cruise control, rear cross traffic alert, automatic high beams, reverse automatic braking, automatic pre-collision braking, and blind-spot monitoring. Spacious front and back seats are provided with plenty of legroom available. 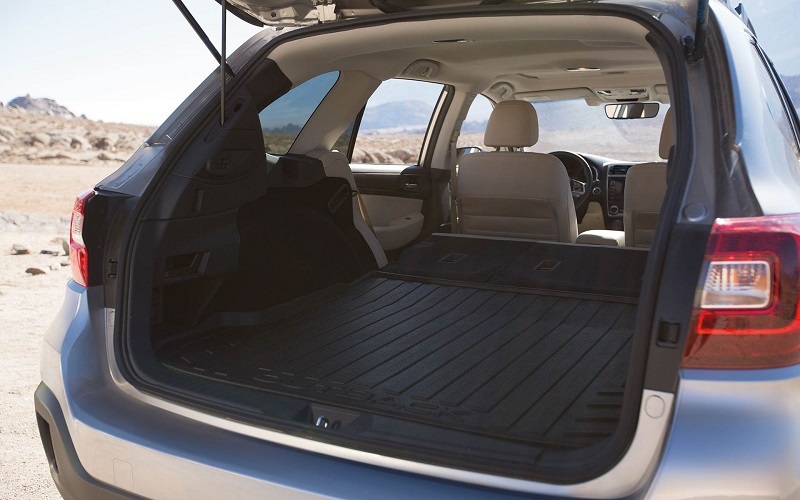 Ample cargo space also increases the functionality of the interior setting. The new 2019 Outlook is built with a 2.5-liter four-cylinder engine that generates 175 horsepower and proves to be peppy, especially when accelerating or driving around town. Drivers can also choose to upgrade to a 3.6-liter six-cylinder engine that has more power under the hood. The fuel economy is excellent with 25 mpg in the city and 32 mpg on the highway, which makes it one of the most economical vehicles on the road. Despite its size, it doesn't lag when you put the pedal to the metal. Outfitted with a 2.5-liter four-cylinder engine that delivers 175 horsepower, the same performance is available in the 2018 Outback. The two engines that are available are paired with a continuously variable automatic transmission. The excellent ground clearance allows it to ride well and tackle many off-roading challenges with ease. Drivers can appreciate the excellent steering that is provided, which makes it easy to feel more at ease when sitting behind the wheel due to the amount of control that is provided. Safety is a top priority in the new Outback, as drivers can take advantage of assistance aids in the cabin that include adaptive cruise control, pre-collision throttle management, lane keep assist, a rearview camera, lane departure and sway warning, LED steering responsive headlights, blind spot monitoring reverse automatic braking, and rear cross traffic alert. The car performed well in crash tests that were conducted by the Insurance Institute for Highway Safety. Safety features to utilize in the previous Outback model include rear cross traffic alert, automatic high beams, adaptive cruise control, blind spot monitoring, lane keep assist, automatic pre-collision braking, and reverse automatic braking. Fewer safety features come standard, but the vehicle also performed well in crash tests by the Insurance Institute for Highway Safety. 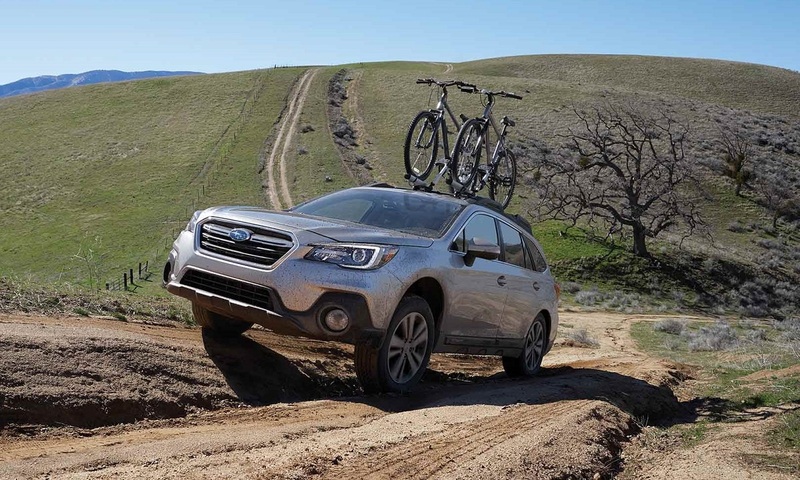 If you want to learn more about the new 2019 Subaru Outback, contact our dealership for a test drive. Our team at Flatirons Subaru strives to continue serving serving Denver Longmont Boulder and will provide you with information on current specials that are available at our location.